White China - 205 items found. Dishwasher and microwave safe. Davenport is traditional off white tableware with embossed strawberry and grape design and has the backstamp: “As originally produced by Davenport 1794-1887 Burleigh Staffordshire England”. A few little minor blemishes inside otherwise excellent condition. Made in England. Brand new and first quality, dishwasher and microwave safe. Replacement lid for the smaller round 1 pint 0.6 lt teapot. Minor variations in size may result in a replacement lid fitting less well than the original. Davenport is traditional off white tableware with embossed strawberry and grape design and has the backstamp: “As originally produced by Davenport 1794-1887 Burleigh Staffordshire England”. This item has been discontinued and is no longer available. Made in England. Brand new and first quality, dishwasher and microwave safe. Replacement lid for the larger round 1.75 pint 1.05 ltr teapot. Minor variations in size may result in a replacement lid fitting less well than the original. Davenport is traditional off white tableware with embossed strawberry and grape design and has the backstamp: “As originally produced by Davenport 1794-1887 Burleigh Staffordshire England”. This item has been discontinued and is no longer available. Dishwasher and microwave safe. Davenport is traditional off white tableware with embossed strawberry and grape design and has the backstamp: “As originally produced by Davenport 1794-1887 Burleigh Staffordshire England”. This is an absolutely gorgeous and extremely elegant coffee pot. In excellent condition with no signs that it has even been used. Made in England. Brand new and first quality, dishwasher and microwave safe. Davenport is traditional off white tableware with embossed strawberry and grape design and has the backstamp: “As originally produced by Davenport 1794-1887 Burleigh Staffordshire England”. Pot with lid, which does not have a cut-out for spoon. It is the same item as the Sugar Pot with Cover. This item has been discontinued and is no longer available. Open sugar pot. Backstamp: As originally produced by Davenport 1794-1887 Burleigh Staffordshire England. Excellent condition. Made in England. Brand new and first quality, dishwasher and microwave safe. Davenport is traditional off white tableware with embossed strawberry and grape design and has the backstamp: “As originally produced by Davenport 1794-1887 Burleigh Staffordshire England”. Pot with lid, which does not have a cut-out for spoon. It is the same item as the Jam or Preserve Pot with Cover. This item has been discontinued and is no longer available. Large pot. Backstamp: Made in England. A few very minor blemishes otherwise excellent condition. Large pot with one central hole. Backstamp: Made in England. A few very minor blemishes and a small firing fault on the bung opening. Dishwasher and microwave safe. Davenport is traditional off white tableware with embossed strawberry and grape design and has the backstamp: “As originally produced by Davenport 1794-1887 Burleigh Staffordshire England”. Dishwasher and microwave safe. Davenport is traditional off white tableware with embossed strawberry and grape design and has the backstamp: “As originally produced by Davenport 1794-1887 Burleigh Staffordshire England”. A little minor surface scratching otherwise excellent condition. Dishwasher and microwave safe. 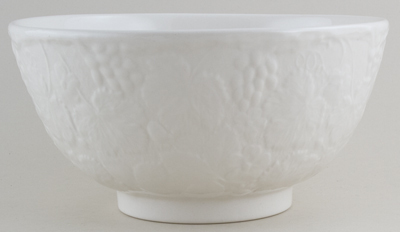 Lovely dish with gorgeous flower knop to cover and two moulded side handles to the dish. 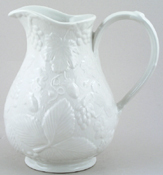 Backstamp: As originally produced by Davenport 1794-1887 Burleigh Staffordshire England. A few very minor blemishes mainly on the cover, and the base has light all over crazing. Dimensions: 19 cm across at neck / 7.5 ins across at neck. Dishwasher and microwave safe. Davenport is traditional off white tableware with embossed strawberry and grape design and has the backstamp: “As originally produced by Davenport 1794-1887 Burleigh Staffordshire England”. This tureen has been previously owned. Good large size tureen with lovely flower knop to the cover and moulded side handles to tureen. There is a small chip under the flower knop otherwise excellent condition. Made in England. Brand new and first quality, dishwasher and microwave safe. Soup Tureen base only, no lid. Davenport is traditional off white tableware with embossed strawberry and grape design and has the backstamp: “As originally produced by Davenport 1794-1887 Burleigh Staffordshire England”. This item has been discontinued and is no longer available. Cup without saucer. Made in England. Brand new and first quality, dishwasher and microwave safe. 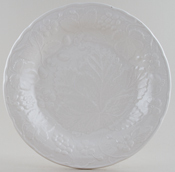 Davenport is traditional off white tableware with embossed strawberry and grape design and has the backstamp: “As originally produced by Davenport 1794-1887 Burleigh Staffordshire England”. Davenport is no longer in production and this item is no longer available. Made in England. Brand new and first quality, dishwasher and microwave safe. Davenport is traditional off white tableware with embossed strawberry and grape design and has the backstamp: “As originally produced by Davenport 1794-1887 Burleigh Staffordshire England”. Davenport is no longer in production and this item is no longer available. Flowers of Burleigh is a range of items ideally suited for the display and arranging of flowers and here decorated in Burleigh's timeless Calico pattern. A traditional rectangular container for flowers, in the Dutch style, with three holes in the top and it would also made a great pen holder. Made in England. Brand new and first quality, dishwasher safe. Backstamp: Calico Burleigh Made in England. This item has been discontinued by Burleigh and is no longer available. Flowers of Burleigh is a range of items ideally suited for the display and arranging of flowers. 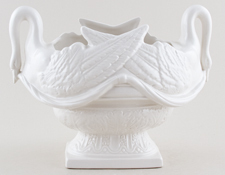 This fabulous centre piece vase has been reproduced from Burleigh's historic archives. Made in England. Brand new and first quality. This item has been discontinued by Burleigh and is no longer available. Made in England. Brand new and first quality, dishwasher and microwave safe. Traditional off-white ironstone china, with hard wearing glaze. This item has been discontinued by Burleigh and is no longer available. Made in England. Brand new and first quality, dishwasher and microwave safe. Traditional off-white ironstone china, with hard wearing glaze. Rectangular tub type with flat cover. This item has been discontinued by Burleigh and is no longer available. Made in England. Brand new and first quality, dishwasher and microwave safe. Traditional off-white ironstone china, with hard wearing glaze. Large Serving Plate. This item has been discontinued by Burleigh and is no longer available.